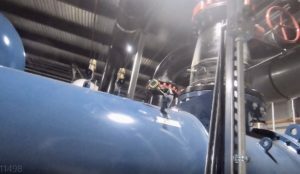 2500 Tons of fun with TruBlu Hoses and the NAVAC NRD16T Industrial Vacuum Pump - 12 CFM! It's not every day you get to work on a machine this big, and what can I say, it was an awesome opportunity to try TruBlu Evacuation Hoses and a NAVAC16T 12 CFM Industrial Vacuum Pump in a big way on a machine bigger then I have ever seen before. Eric Preston of TTT standing in front of the chiller for scale. While I have worked on a lot of residential appliances, the majority of my trade background is large package and 70-700 ton built-up systems, gas furnaces, and boilers. 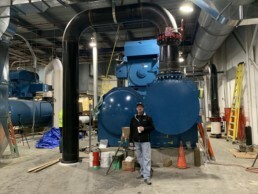 I have participated in many teardowns of equipment of this type of equipment (up to about 800 tons) and I have seen equipment up to 1000 tons, but before this one, I had never even laid eyes on a 2500 ton chiller. To put it into perspective, it was like evacuating the inside of two school buses. 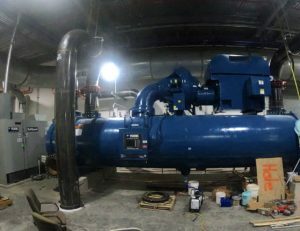 The equipment room we were in was a work of art with over 1,000,000 tons of cooling, we were there with Johnson Controls, Andrew Greaves, and Bradley a master mechanic for York evacuating the last chiller of a bank of three 2500 ton machines. These machines are R-134a, and typically evacuated to 5000 microns, using a process that some might consider antiquated, but I will say after testing does have some considerable merit. (The old guy might not always know why, but they do often know what has worked in the past and what works). More on that later. The evaporator and condenser for these machines were about 54 inches in diameter and 28 feet long. This means just in the evaporator and condenser we are talking about 890 cubic feet of volume and the machine had been test-run at York prior to delivery (a very important detail). These machines typically are scheduled for 4-6 days of evacuation to reach the 5000-micron level. They are evacuated from a single connection at the evaporator barrel. As the internal volume is so large, the system conductance becomes somewhat negligible, and what you connect to the system to perform the evacuation is most important. We have not decided if pulling from more then one point would even be of any value, as the hose and the fitting conductance speed already surpass the capability of most pumps. Now the machine was delivered with a holding charge of nitrogen, and it was leak tested with the "trace" of refrigerant left in the oil after testing. We obviously were not dealing with any moisture or ruptured tubes, so freezing water (as there was none present) was of no concern. We used a standard 1-meter TruBlue hose with (1) 1/2" connection, by KF at the pump end. The hose is rated at 16 CFM at 10' of length, so at 3 feet the hose can handle over 50 CFM at 1000 microns. TruBlu is super flexible, has low gas permeation, and a higher conductance speed than any hose on the market today. With the flexibility of fitting ends, we were able to connect directly to the chiller without stepping down the connection. The pump, provided by NAVAC was a 12 CFM industrial pump with a two-stage ballast, a large oil reservoir with an oil capacity of about 1.75 quarts. The pump equipped with a KF16 fitting at the pump end sized specifically for the TruBlu Hoses. The pump was tested prior to installation and could easily achieve 2-3 microns in a few seconds. I have worked with a lot of vacuum pumps over the years, both commercial and industrial, and the NRD16t is an impressive beast of a piece of equipment. Mounted on a cart, and weighing about 80 lbs, this pump is of exceptional build quality. It is designed for continuous operation and is ideal for long pulldowns like that of this job. 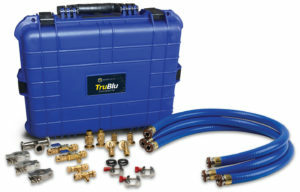 With the addition of the TruBlu hose, we could still easily achieve 3-4 microns at the hose end. We had a micron gauge at the pump for pump testing, and on the condenser barrel on the far opposite side to measure system vacuum. We were curious how much difference we would see from one side of the system to the other. Micron Gauge on the Condenser. The NAVAC 12 CFM pump is not a standard vacuum pump. It is designed specifically for industrial and medical applications, so between the pump and the oil (designed specifically for the pump), I have seen nothing on the market like it. The pump did a tremendous job handling the refrigerant without dilution of the oil and had a continuous capacity that I had never seen in a pump before. It is designed for continuous duty, and the entire evacuation was done without a change of oil. At the end of the evacuation, the pump was still pulling 3-4 microns indicating the oil was still in very good condition. The NAVAC NRD16t is also equipped with an inlet strainer, and an oil vapor arrestor to handle any oil vapor the pump might produce. 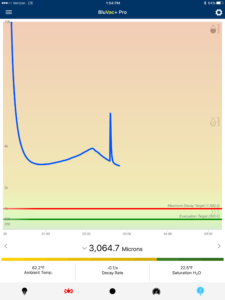 The entire time, the pump did not cloud the equipment room with oil, but we did notice about a 1/4 quart reduction after 17-hour continuous pumping. With everything hooked up, we started the pump, and boy did this thing hog some air! Now before I go too far, I had run some initial calculations and considering the volume and I expected to wait no less than an hour to see any indication of vacuum. Here we were, less than 45 minutes in and we were approaching 3,000 microns of vacuum. Impossible you say? You would be correct! BluVac Professional Exposed to a Refrigerant. Now for the rest of the story. Remember, I said "test run at the factory" and you might start to have an idea of what we were witnessing. 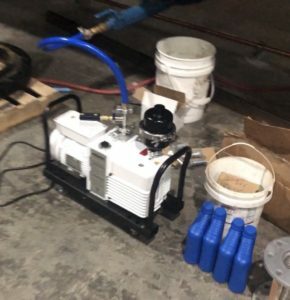 When a chiller of this size is recovered, even if the required levels are met, the oil which is missable with the refrigerant is still holding a lot of R134a refrigerant maybe even upwards of 100 lbs. Although the oil was drained for shipment, the factory trained tech on the job estimated at least 5 gallons was still in the system. If you have every exposed a vacuum sensor to a refrigerant, then you would know what we were seeing. 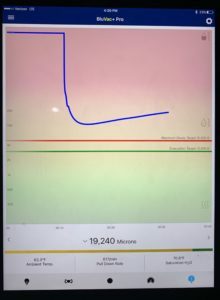 As there was a very quick drop, then a gradual rise as the refrigerant was exhausted and the environment went from "refrigerant laden" an environment of essentially nothing. Yes, at first even I thought we had a leak, especially after barely touching the valve stem on the condenser barrel where the micron gauge was installed resulted in a sharp spike in the vacuum level. We decided at that point to break the vacuum with nitrogen and see if we could carry out some of the refrigerant gas and restarted the vacuum about 3:00 PM. The second go-around was much more like I expected. A considerably longer delay before we even started to indicate vacuum. Again though, after an initial deep draw, we started to again see the effects of the refrigerant, although this time at a much higher level. Just to confirm, I called Dennis Cardinale of Accutools to confirm what in fact what I was seeing was the effect of refrigerant. At that point, I did not really care how much experience I had. I simply wanted confirmation that what I thought I was seeing was the likely culprit. Asking how long an evacuation will take is like asking how many licks to get to the center of a tootsie pop. The world may never know. But what we did know was whether the environment was air or refrigerant, eventually, it would converge as the atmosphere was removed and the vacuum gauge would start providing accurate information. This is characteristic of all thermal vacuum sensors no matter what the brand. The advantage with BluVac was however was we were able to document it. At that, we headed back to the hotel for the night and decided to meet up at 8:00 am to see our progress. If you read the York Chiller installation manual, you will see reference to a wet-bulb gauge that was used to perform the evacuation. Essentially a test tube filled with Methanol equipped with a thermometer to indicate vacuum based upon the boiling point of the Methanol. They are still made today under a brand called Vac-U-Ator, an almost unheard of older technology (maybe only outside of York) but it still has merit. What the old guys knew or noticed was the same characteristics of vacuum with thermal gauges that we experienced, and I am guessing that they also noticed that the old method simply did not indicate vacuum under the same set of conditions. Now that said, you will notice that a vacuum gauge can also be used for this process, and that is what I would recommend, but I am guessing that the old school technology would not indicate vacuum due to refrigerant pressure unless a deeper vacuum was truly present. So for roughing levels of vacuum, maybe to 1000 microns, you can see that this might be a very good indicator. I am still not sure why York allows a vacuum of 5000 microns on this machine as it does contain POE oil, but I am guessing that it is acceptable as that is what was in the IOM. The contractor wanted to go down to at least 500 microns with a decay no more than 1000 microns over an 8 hour period. A deeper vacuum simply provides better dehydration. So how can you easily differentiate between refrigerant outgassing and a deep vacuum with a thermistor vacuum gauge? Simple, in a deep vacuum, there is little to no exhaust from the outlet of the pump, and yes, I realized that in hindsight. Hindsight is always 20/20. Consider the environment, the refrigerant environment. Refrigerant will mess with your vacuum sensor until it is gone. If you feel gasses coming from the pump outlet, and you are indicating vacuum, you are still outgassing refrigerant. This is not as noticeable in smaller equipment simply because the atmosphere is removed so fast. Vacuum decay times take much longer on larger systems. Do not try to determine if the system is dry and tight in any less then 4-6 hours. My advice, heed the manufacturer's instructions. Vacuum pressures stabilize very very slowly. The pressures are extremely small. Don't rush this step. Use a good 20 amp outlet when you are using a big pump! We found out the hard way. The pump would start then immediately stall due to voltage drop. Moving to an outlet closer to the panel and using a 10 gauge cord resolved the problem. Less then 24 hours after we had started the second pull-down, the results were nothing less than impressive! How impressive? I will link to the video as soon as Andrew posts it here. Interested in tools we used? 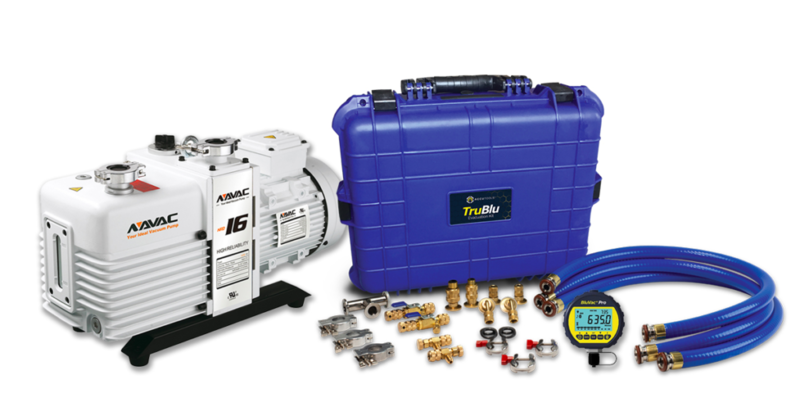 Find the TruBlu Professional Kit and NAVAC NRD16T Here. The TruBlu hose has a ¾-inch internal diameter, delivering 16 cfm of conductance speed at 1,000 microns. The TruBlu hose is extremely tough, ultra-smooth bored, and yet the flexible-wire reinforced PVC means it just won’t kink or collapse. TruBlu is resistant to abrasion and crushing and can be knocked back to round if accidently flattened. Additionally, the UV compounding has excellent weather resistance to provide years of reliable service. The proprietary polymer blend has extremely low air permeation, water vapor adhesion, and outgassing, making this hose ideal for vacuum service. A fast evacuation is a function of the components used in the process. TruBlu is engineered for HVAC and uses an industrial-rated vacuum hose as well as vacuum-rated KF fittings for quick hose configuration and vacuum-tight connections. With its patent pending KF fitting designed specifically for HVAC applications, a TruBlu hose can be configured in the field for pump and service valve connections from ¼-inch, 3/8-inch, to even ½-inch fittings (even those with 90-degree adapters). Each fitting and valve has been carefully engineered from the core tools to the core depressors to assure vacuum-tight connections ideal for HVAC applications. Our web site has a brand new design that incorporates the latest in web site technology! This makes it even easier to learn about the latest AccuTools products and solutions. Our user-friendly layout is mobile friendly so it looks great on a phone, tablet as well as desktop computers. Take a look around at our updated product details, support sections and our brand new blog!